Eurostar, the high-speed rail service linking the UK and mainland Europe, is treating Business Premier customers to an exciting new destination – the London cocktail bar. Located upstairs in the London lounge, the circular black and gold bar provides an atmospheric space for travellers to sample a selection of complimentary cocktails designed exclusively by the London Cocktail Club. Featuring a range of Dutch, French, Belgian and British spirits and ingredients, the drinks encapsulate Eurostar’s heritage, reminiscent of all four cultures in which it operates. From tipples titled Earl’s Elixir to Bourbon Boisé, the drinks are sure to suit tastes on either side of the Channel. Michelin star chef and Eurostar Business Premier Culinary Director, Raymond Blanc OBE, has also designed a bespoke cocktail exclusively for the lounge in partnership with the London Cocktail Club. Named Lavender Dusk, the signature cocktail is a distinctive mêlée of delicate florals, punchy fruit flavours and piquant undertones. Mixed using Eurostar’s very own gin, Toujours 21, it is a delightful fusion of French botanicals and honey from the Kent countryside. For the first time, Eurostar is introducing a winter G&T menu, featuring gins from Amsterdam, Brussels, Paris and London. Each exotic gin is perfectly paired with local tonic to offer passengers a twist on the classic. Designed by global architects, Softroom, the new London cocktail bar will refresh the travel experience for Business Premier passengers. 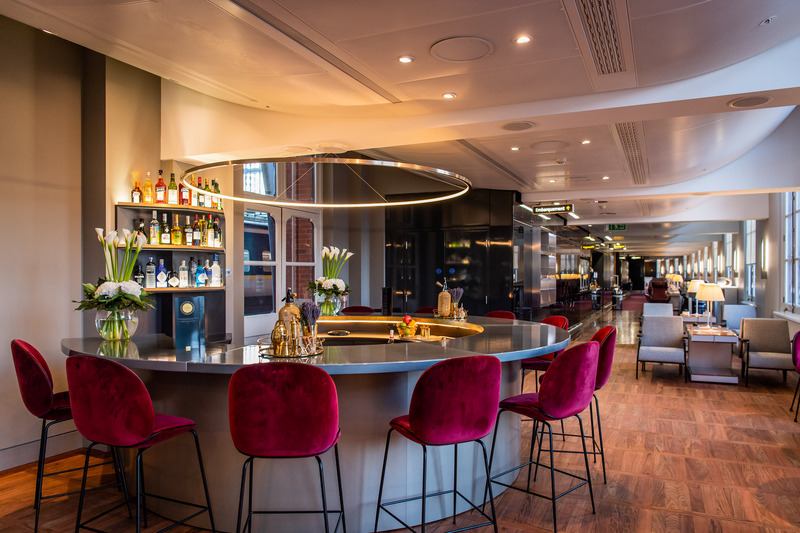 With a chic circular bar featuring a gold table top and plush velvet chairs, the new bar offers a stylish environment to ease into the evening, making it the perfect place to unwind after work or kick-start the holiday. The launch of the new bar comes as Eurostar continues to invest in its stations and service. With the recent introduction of Chop-Chop, the express hair salon in the departure lounge, eGates in London St Pancras to speed-up the security process, and World Duty Free, Eurostar is committed to improving the customer experience. The introduction of the new bar marks six years since Eurostar and Raymond Blanc joined forces to transform the on board dining experience for Business Premier passengers. Renowned for his passion and innovative culinary expertise, Raymond works with each of Eurostar’s three kitchens to design seasonal menus combining the best of British, French, Belgian and Dutch cuisine. Eurostar’s Business Premier aims to offer the highest standards in cross-channel train travel and a superior experience for passengers. With fully flexible fares, Business Premier customers can enjoy a 10 minute express check-in, exclusive access to the business lounges, plus complimentary drinks and fine dining all served in the comfort of their own seat.